Here’s something to ponder over while you wait for the BLS to release its final jobs report before the election. Gallup released its monthly unemployment survey on Thursday, and it showed a seasonally adjusted drop from 8.1 percent in September to 7.4 percent in October. The Gallup numbers are quite a bit more volatile than the official BLS numbers, as you can see in the chart below, but in general the two surveys move in similar directions. If that happens again on Friday, the BLS numbers will show a drop from 7.8 percent to…..I dunno….maybe 7.6 percent or so: a smaller decline than Gallup, but moving in the same direction. Or maybe not. We’ll know Friday morning. FRIDAY MORNING UPDATE: Nope. 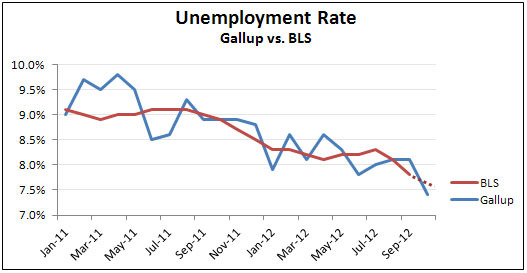 Unemployment ticked up to 7.9% according to the BLS report.